FreetuxTV is a TV player for Linux that lets you watch free Web TV Channels and listen to Radio. 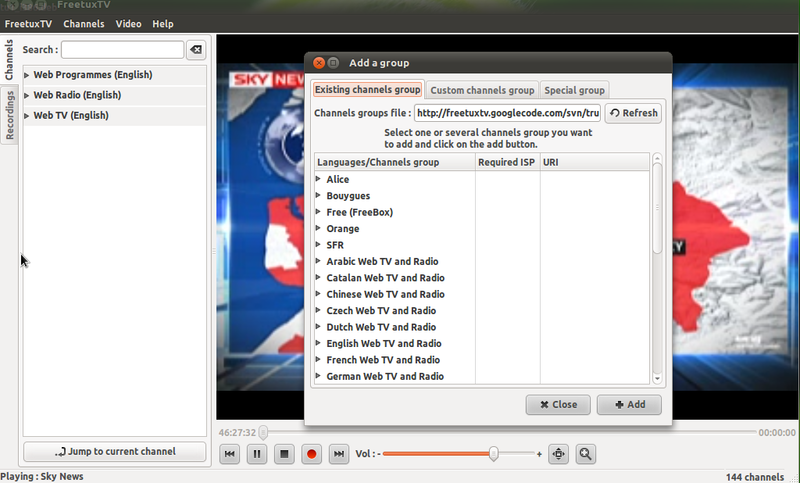 The application that runs on VLC as backend comes with lots of pre-added channels for many languages. You need to have VLC player installed on your system for FreetuxTV to work. If for some reason the PPA is not working for you then download .deb packages (as per your installed VLC version) from here. 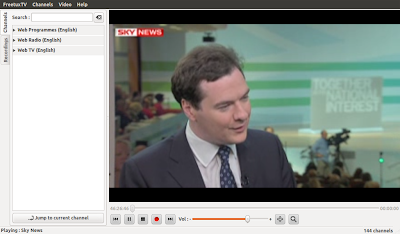 FreetuxTV works with VLC Series 0.8.6, 0.9.X, 1.0.X and 1.1.X. Download appropriate package for your distro (keeping in mind VLC version) from here. As you notice some of the packages are missing, the developers need people who can package the application for various distros. So, if you can help, please visit their official site. After successful installation, go to Applications > Sound and Video and launch FreetuxTV. You will see a new window with a list of Channel groups. Each language specific group contains lots of different channels (music, news, sports and more). Select a Channel Group and click on Add. You can add more Channel Groups later. Now simply select your favorite channel from the side bar and click on play. You can record TV by clicking on the record button or better you can set duration of recording. So start the channel, set the recording duration for say 60 minutes and leave your computer. When you come back, you will get a recorded clipping of your favourite show. You can record the video in two formats: Theora+Vorbis (Ogg) and H.264+MPGA (MP4). I could not play the recording in default movie player as it showed some error. But it played flawlessly on VLC. Also, I decided to randomly play 15 different channels from different languages to test links and most of the channels were working fine except one. Edit: With further testing, I found that there are few broken links but not too many. A large no of channels work. The only thing is that you have to play once to test them. Also, if some channel is not working for some reason, try refreshing the list as the channel links are updated regularly. Lastly, many popular channels were missing (for obvious reasons), which we usually watch but still there are some really good channels and you can add more channels if you know the link for streaming live feed.